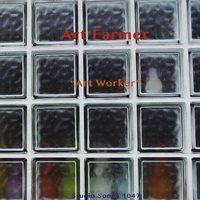 Description: Art Worker captured trumpeter Art Farmer in an interesting septet setting which sounds like a small big band with two trumpets (Farmer and Ernie Royal), a trombone (Jimmy Cleveland), a saxophone (alto, tenor or baritone by Oscar Estelle). The fine rhythm section comprises of Harld Mabern on piano, Jimmy Woode on bass and Roy McCurdy on drums. Recorded live in Frankfurt in 1968 when Farmer was living in Vienna, the program includes four compositions by Viennese musicians he had come to know: "Erwagung" and "Orientierung" by trombonist Erich Kleinschuster, "Delphine" by reed player Hans Salomon, and "Gradullere" by pianist Fritz Pauer. The other three songs are by Farmer. It's interesting to note that the tunes composed by the Viennese musicians are rooted in the tradition of bebop, enhanced with sophisticated harmonies and lyricism while Farmer's compositions utilize Latin and funk rhythms. Newly remastered in Japan based on the original mono master tapes for broadcasting, this reissue CD is an important document of Art Farmer in 1968. A must-have item for his fans! Recorded live in Frankfurt, 1968. This Japanese reissue CD released by Studio Songs in September 2014. Mono.